Outdoors: Possibly the simplest experimental set-up by shooting against sunlight! The image on the left was shot outdoors with a bright sunny sky. 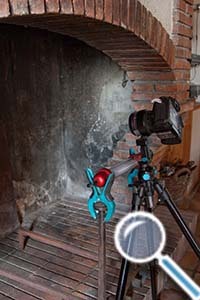 The image on the right was shot indoors next to a French window lit from a cloudy sky. 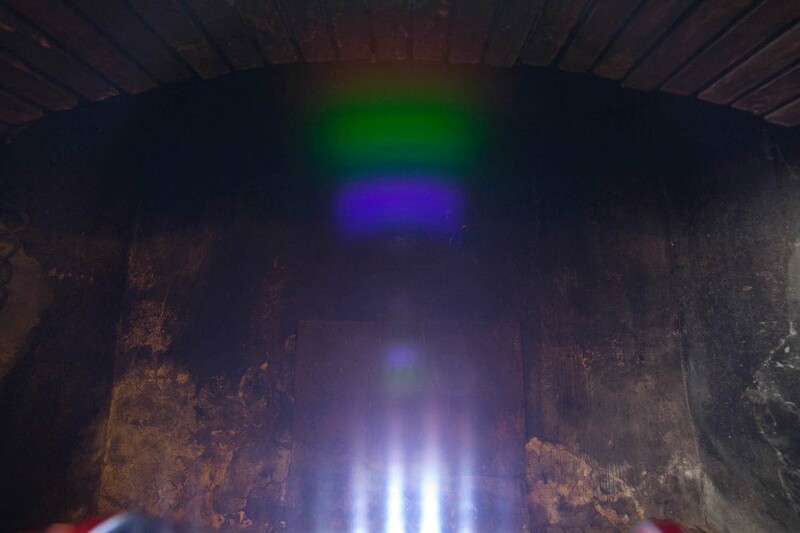 The goal of the experiment is to verify that there is a visible difference when the camera is oriented vertically with the battery on top and when it is pivoted upside down. 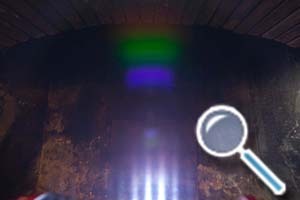 (Too) many complex features related to flare co-exist on the images at the top of this page that hampers the analysis of the phenomenon in a serene and effective way. 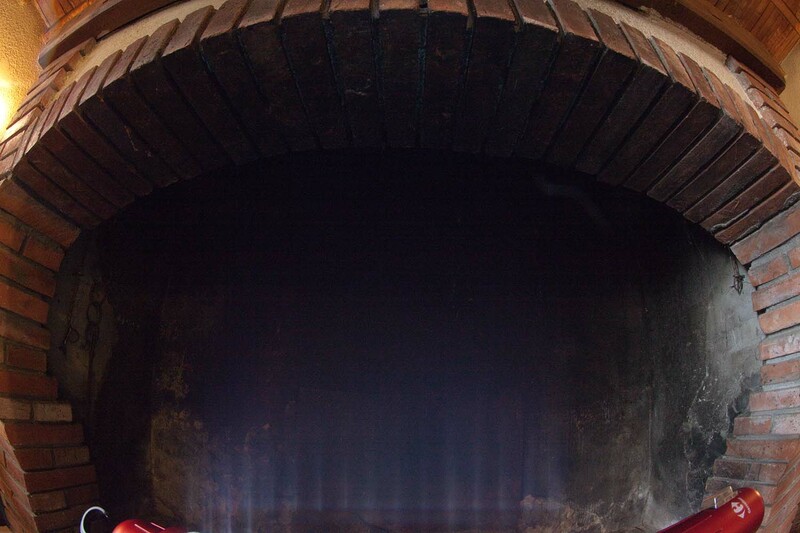 To get a definitive clue out of the images shown above because the cause of the phenomenon seems quite elusive. I therefore decided to build an experimental setup to better control and analyze the impact of the Flare in an attempt to determine the cause of it. To expand on the observations that were already made,let us see what happens when1) the light rays from a bright light source(s) are hitting the focal sensor plane just outside but near the border of the CMOS sensor. 2) In addition, a dark-shadowed background for the photos would make the flare effect more visible than if it was more in the high key side.. 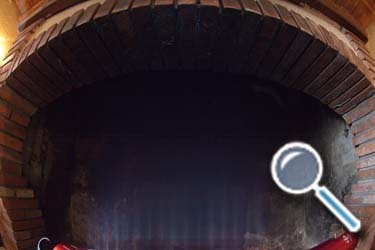 The 60 LED flashlight is supported on the top of a pair of firedogs on the front step of a large open fireplace where soot makes a rather dark background. The benefit of having discrete (i.e. separate) points of light is to be able to see how the veiling glare is constructed. If a large and long uniform light source had been illuminating, this phenomenon could not have neen discerned. The center part of the LED array was directed through the entrance pupil of the lens. 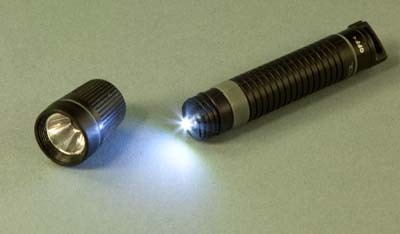 As a consequence and because the LED have all a parallel active axis, the other LEDs that are closer to the ends of the flashlight are not directly oriented toward the entrance pupil of the lens. 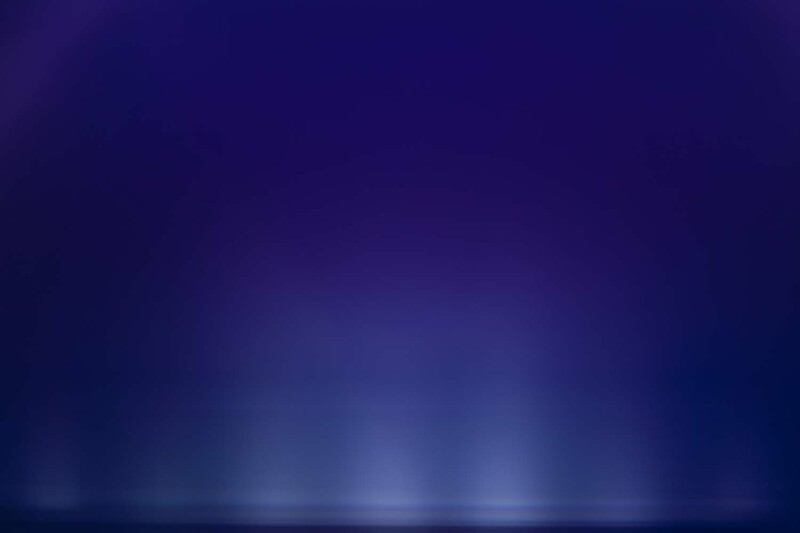 Thus the streaks of light become fainter when going toward the lower corners of the sensor frame. 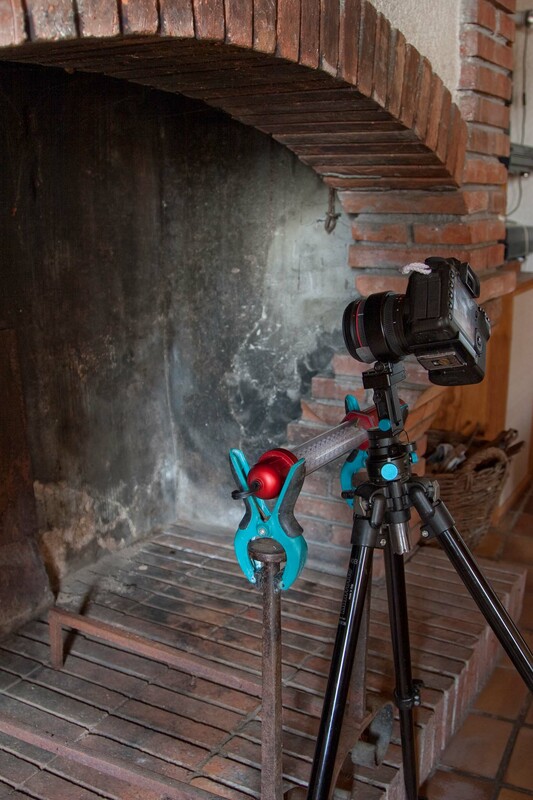 In the course of the experiment, the camera was pivoted 360 deg. 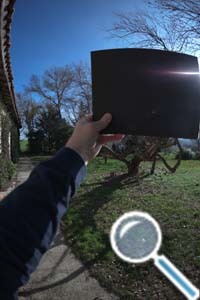 around the axis of the lens: the reader may hit left and right arrow keys on the keyboard (step by step) to move the rays of stray light around the image center and observe the moving effect of flare and veiling glare. 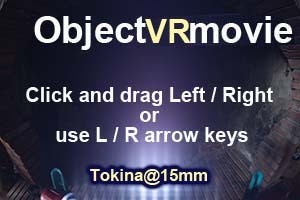 it is strongest when the light is coming from underside of the camera in the object space (i.e. stray light hitting the underside of the locked up DSLR mirror). On an other experiment (not shown here) we may however observe that it becomes almost not existant when the hit is just out of the limit of the sensor coverage before getting its dreaded full strength a bit further outside the sensor coverage. Finally and of course, it goes back to absolutely no effect when it is extinct (i.e.it doesn't enter the entrance pupil). Note that the streaks of stray light are all perpendicular to the lower side of the image. They are not radially converging toward the center of the image. We must conclude from all these observations that another factor than the lens itself is mainly contributing to the creation of the phenomenon. 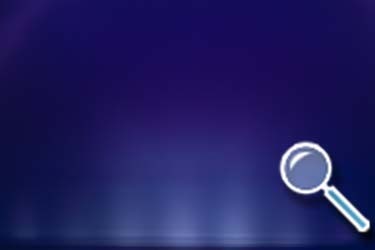 The white horizontal lines (parallel and close to the lower side of the thumbnail image of the animation here above) are probably due to diffraction and/or refraction on the edges of the thin filters(of different sizes) that are stacked in front of the CMOS and are all larger than the sensor itself. This wild guess has to be confirmed though. 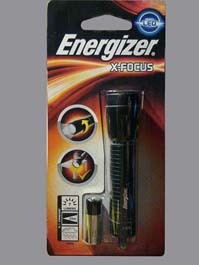 You may buy for instance this Energizer X-Focus personal mini-flashlight (aka Energizer X113L ) which price is only a few bucks. 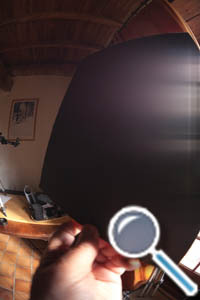 Holding the flashlight fixed and (roughly) aimed at the Entrance Pupil of the lens, the camera can then be rotated in a plane around the Entrance Pupil. 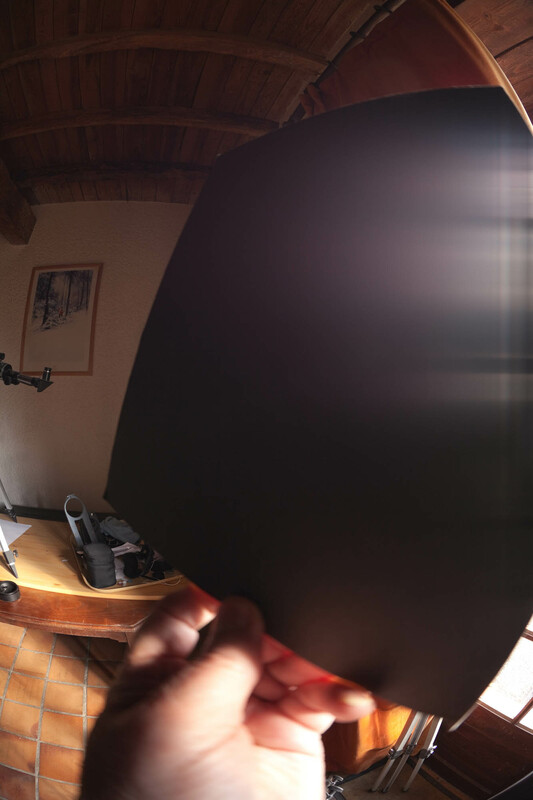 The panorama photographer can for instance easily do this when his camera is mounted on a panorama head. As usual. 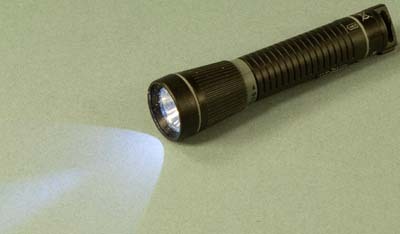 Or alternately, the experimenter can leave the camera in a fixed position to shoot a photograph of the LED. The flashlight shall be moved to be seen in the field of the camera + lens combo or outside of it. The LED shall be aimed at, and kept at an approximate constant distance from the Entrance Pupil. The background of the picture should preferably be as dark as possible (the sheet of cardboard is OK if the general scene lighting is dimmed).